A book I will definitely listen to again! After finishing this audio book, I thought, "That was so much fun!" The narrator has a soothing voice that is easy to listen to. I could easily keep track of which character was speaking. That, I've found, is not true with all audio books. The story itself was entertaining and heart tugging. I don't blame Lydia for wanting to adopt an orphan. Molly, the little girl, was so endearing and fleshed out as a person that I wanted to take her home too.There was a hint of intimacy in the book, just like I enjoy. Nothing graphic or embarrassing. It was beautifully and tastefully written. The christian message of God guiding our actions and steering us is one that I found thought provoking. I also was challenged by the idea of forgiveness that is demonstrated. Both themes are developed well in the book. I received this audio book through Audioboom. Still, I listened because I was intrigued by the description and the series. This is my honest review of a fantastic book done artfully by a talented narrator. Raised with advantage and privilege, Daisy must now find a husband. Because of her overwhelming shyness, she chooses to let her aunt Harriett Farmer find her a husband. Aunt Harriett’s suggestions are not what she expected. 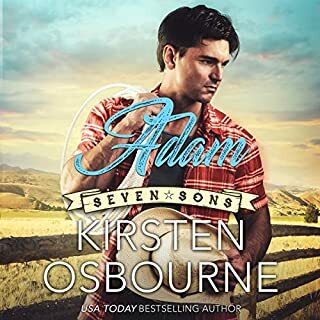 Setting her up to be a mail-order bride, she sends her to Montana to meet Eli King. What she finds is a life vastly different than what she's used to. 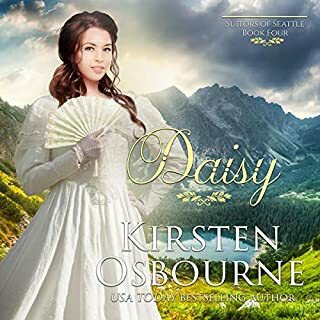 Daisy is the fourth daughter and fourth book in the Brides of Seattle series. She was also shown as so shy in the other books that I wondered how the author could even write a romance for her. Wow! What a romance! I love books with mail-order brides and this one didn't disappoint. Because she is shy, Daisy decides to marry a man she's never met. 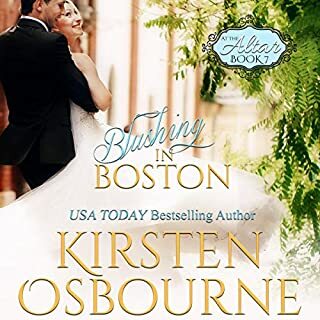 (Eli, the groom, was actually a likable secondary character in another of Ms. Osbourne's books, Mail Order Motherhood.) The chemistry between the couple is fantastic. Yet it's Daisy growth in confidence and maturity that adds a delightful element to this romance. The book's plot covers several months and is definitely a well-planned out and carefully crafted story. Tiffany Williams' narration brings it to life and adds well-thought out interpretation to the lines of dialogue through her voice inflections. She creates individual voices for each characters so that I found it easy to understand which character was speaking, even if it wasn't explained in the book's text. A Fantastic job as always, which is why she is one of my favorite narrator's. Great adventure and sweet romance! 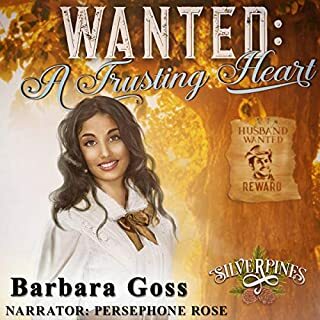 The heroine is someone first introduced in another book by Barb Goss, Wanted Horsebreeder. I liked her in that book and admire her tenacity in this one. It is an adventurous and sweet book. The only thing I didn't like was that the narrator made her sound whiny. She is anything but so I wished he had interpreted her character better with his voice inflections. 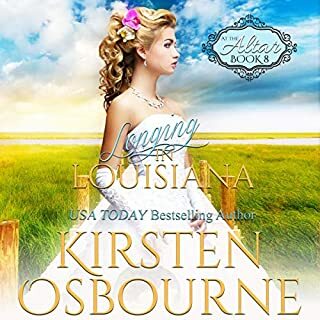 Missouri, 1840: Coming to America was supposed to be a new adventure, a chance for a fresh start in a new country, for Hayley Hunter and her husband. She never dreamed her journey would land her alone in a strange place with nobody she knew. She joins up with a wagon train in the hopes of meeting up with her brother and his family along the trail. 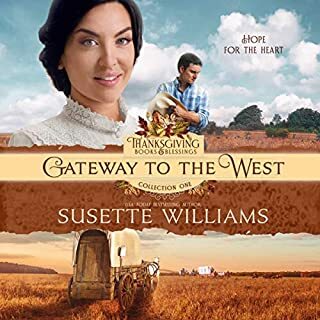 Malcom Wheeler knows the hardships and heartbreak families face, but there’s usually safety in numbers, so he runs his own wagon train to try and help people determined to head out west. I love wagon train romances! This one did not disappoint. There was a sense of the progression of relationships after many weeks on the trail as well as the fear that must have accompanied life on the trail. I felt like I got a much better sense of the hero's character than the heroine's though. She was there to flesh out the hero and his struggle with past hurts. There were points at which I was confused by the timing of past events but those were insignificant compared to how well the action of the novel was developed. The narrator had an easy-to-listen-to voice and did an great job of interpreting characters' inflections. My only complaint was the narrator's accents which weren't always used throughout consistently. Sometimes the heroine sounded southern and sometimes she was British. Angelina Ellsworth once believed in love - before she discovered her husband of mere hours was a slave-trader and already married. To avoid the scandal and disgrace, she escapes to the estate of her aunt and uncle, the Duke and Duchess of Waterford. When Angelina learns she is with child, she vows she'll never trust a man again. Become immersed into another time and place. 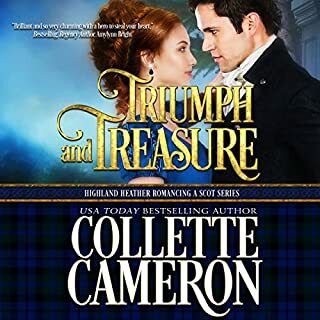 Collette Cameron truly immerses the reader into the world she creates. The descriptions are rich and the trials of the hero and heroine truly pulled at my heart. I felt so badly for the heroine especially and so liked the hero and wanted good things for both of them. It is wonderful when a reader can find a book to identify with! I won't give away details, but there are many obstacles to overcome before the happy ending comes. My only complaint is with the narrator. He has a cultured, rich voice but is almost insulting in his female voices. I found him annoying to listen to after a time. I think this book might be better read than listened to because of the lengthy description and because of the narration. I did receive the audio book from the author and am giving an honest, voluntary review. Entertaining Story to Get Lost in! I really enjoy the series that this story is part of. I have read the book, but that didn't diminish my enjoyment in listening to it! 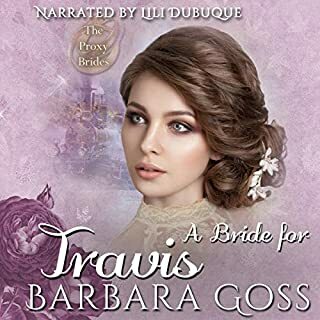 Tiffany Williams' narration lulled me so that I found myself totally immersed into the story, feeling as if I was there.I received a code from the narrator in order to listen and give an honest review so I was trying to listen critically but the book is just so well-written and narrated so well that my mind was fully engaged by it and I just allowed myself to enjoy the excellent production of the novel. One thing that made this such a great read was the narrator's ability to create distinct voices for the characters. I was really impressed with that. It was like listening to a dramatization instead of just someone reading a book. I strongly recommend this as a title to buy. Phoebe Glenn has walled herself away from love, not daring to risk what it would mean to be vulnerable. She keeps herself busy with work and friends, and she believes she's put the past behind her - until Bryce walks into her real estate office. Bryce Davidson was a world-class rodeo cowboy until one split second took everything away. Now injured and retired, he comes back to his hometown of Burnt River to start over, not realizing how that choice would impact so many others' lives. 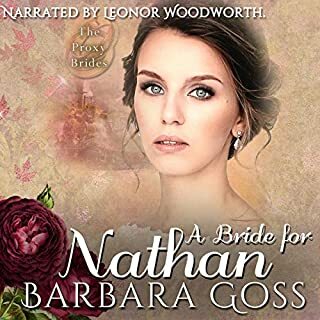 Typically I read or listen to historical romance, but the author sent me a code to receive this audiobook. This was an easy story to follow, even if you haven't read any of the other Burnt River books just like I haven't. There isn't any incredibly tense external conflicts. Most of the conflict is internal for both the hero and heroine. Thsi makes the story just a little slower and less suspenseful than the books I usually read. However, I could easily believe that the characters in this book are real as the writer creates such good dialogue and characterization. I didn't care for the narrator's performance, especially the nasal voice used for the hero. Still she has a nice enough voice so that I was able to listen to the book in one sitting.